The wait is finally over, microconsole fans! 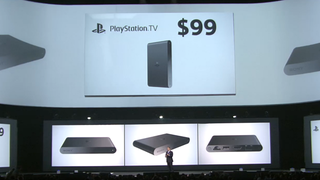 Sony just announced that it's bringing its super teeny tiny PlayStation TV to the U.S., Canada, and Europe this fall. Sony originally released the gadget last year as the PS Vita TV. Even then, the thing sounded like a great bargain: a small and decently-priced machine that could play Vita games, a host of older PlayStation console games, and a handful of entertainment apps. Also, Sony promised that it could eventually be used in a similar way to the mobile Vita console to stream PS4 games so people could play them on other TVs around the house if needed. The only problem was: it was only available in Japan, and Sony didn't have much to say about a possible international release at the time. So while Kotaku's Richard Eisenbeis seemed like he was having a grand old time with the thing, none of us gamers here on the Western Hemisphere knew when were gonna be able to get our hands on it. Well, the PS Vita TV is back—and it's looking better than ever with a new name and a classy black finish. In addition to the $99 standalone model, it will also be available as a $139 bundle that comes with a Dual Shock 3 controller, an 8GB memory card, an HDMI cable, and a copy of The Lego Movie game.